My wife and I went to see The Island last weekend. In this movie, we are introduced to a world where the rich and powerful grow clones of themselves so that they can stay young and harvest spare organs to keep themselves healthy. There are shades of Logan’s Run and Freejack in this film. The mad scientist running the cloning center found that growing bodies for organs was not enough. The clones would not stay healthy without allowing them to live. The clones are allowed to develop enough to be part of the community waiting to go to The Island. 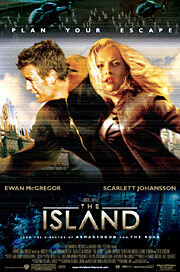 Getting to The Island was the goal of the clones inhabiting the center run by the mad scientist. The clones lived to win a lottery whose winners thought they were going to the only spot on earth untouched by a global ecological catastrophe. Of course, the clone was actually selected because their owners needed spare parts. Like real life, the clones were not considered human, and were treated as property. At the convenience of their owners, the clones were harvested. The reality that the clones were sentient beings was a closely guarded secret; a secret that some were willing to kill in order to keep it that way. Hence the chase scenes as the clones struggle to unravel their purpose and their humanity. Likewise, Congress is grappling with the issue of fetal stem cells. Should some human beings be created and harvested so that other human beings might live? One group of humans has no voice, cannot vote and many deny that they even exist as anything but tissue. The other group is acting from self interest, desperate that some scientist can get the winning sample to prolong their lives. This group of humans vote; the older they are the more they turn-out on Election Day. There is no limit to the amount of government monies that they are willing to spend to put off death. In our culture nothing is worse than suffering and being ravaged by disease. We talk in terms of quality of life. We make a mental balance sheet and when the liabilities outweigh the benefits, we try to find a way to change the balance or check-out before it hurts. It is no wonder that the purveyors of eugenics including the abortion industry are trying to exploit our fear of death and suffering to create a socially acceptable justification for the slaughter of even more pre-born humans. Now instead of throwing children away in the name of convenience, we can comfort ourselves that its ok because we are furthering the science of prolonging life. What irony that we justify snuffing out life to prolong life. DR. Mengele and his ilk would surely be proud that the nation that defeated his Nazis and gave the world the Nuremburg Trials has adopted his ideology.